This April R3 Continuum (R3c) will be exhibiting at both Continuity Insights and RIMS conferences. R3c is excited to share with the business continuity and risk industries how their strategic crisis leadership services can help to ensure an organization’s crisis management solution protects and cultivates the wellbeing of the organization at all levels. 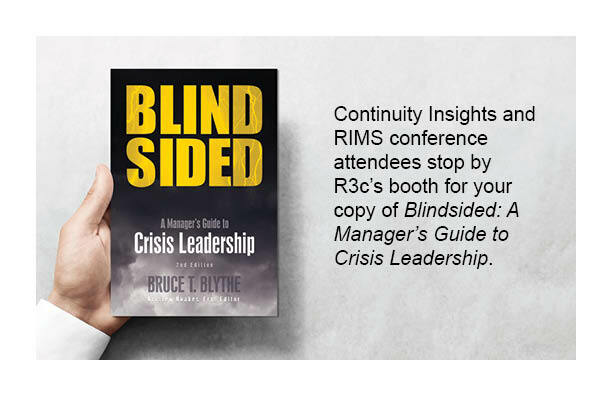 If you are attending Continuity Insights or RIMS stop by R3c’s booth to get a copy of Blindsided: A Manager’s Guide to Crisis Leadership. If you are not going to be at either conference you can purchase a copy from Rothstein Publishers. R3c’s booth at Continuity Insights is Booth 624/626 and at RIMS is Booth 500.